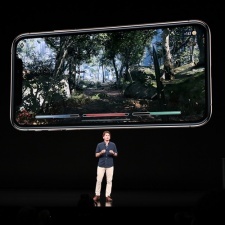 Bethesda designer Todd Howard took to the stage at Apple’s iPhone reveal to show off some gameplay from upcoming mobile RPG The Elder Scrolls: Blades. Howard showed off some slight combat details with an attack, block and magic function available with each having their own bar. The main thrust of Howard’s showcase, however, revolved around the games’ visual prowess. He reminisced that the medium had come a long way from when he designed his first game at the age of 12 on an Apple 2, saying that scenes like those available in Blades used to only be possible on a high-end console in your living room. "We've been able to pull off some incredible environments that just weren't possible before,” Howard said. “12-year-old me would not be able to comprehend all these pixels, all 2.7 million of them." Initially unveiled back at E3 earlier this year, the mobile Elder Scrolls game is currently marked for a fall release this year. Apple’s keynote also saw the reveals of the iPhone XS, XS Max and XR, which are based on the X range revealed last year. The iPhone XS Max is set to become the most expensive handset Apple has sold to date and will fetch a price between $1,099 and $1,446, depending on how much storage comes with it. The iPhone XS, on the hand, will match the price of the iPhone X and will sit between $999 and $1,349. The iPhone XR, meanwhile, will represent the cost-effective option and will be available from $749 to £899. Previously titles shown off on Apple's stage have included Monument Valley 2 and Super Mario Run. The former is widely seen as one of the best mobile games ever, while the latter represented a seismic shift as one of the industry's oldest and most influential companies made moves into this sector.